QP is a magazine that is dedicated to the world of fine watches. Buy a single copy or subscription to QP magazine. Followed by £20.00 every 12 months by direct debit. The name of the publication comes from the French word ‘Quantieme Perpetuel’ which means perpetual calendar. The UK bimonthly magazine has a focus to provide all the news on fine watches and watchmaking on an international basis. In the pages of you will find feature articles on major watch companies, auctions, the collecting of antique watches, and the history and expertise involved in watch making. There are profiles of watch companies and watch collectors like Marcus Margulies who owns a watch store which is considered to be one of the finest watch stores in the world. Watch style trends are also carefully monitored in QP like the interest in simple, contemporary classic watches. Technology is a major part of watch making and QP covers the changes in the way watches are put together and all the new enhancements. 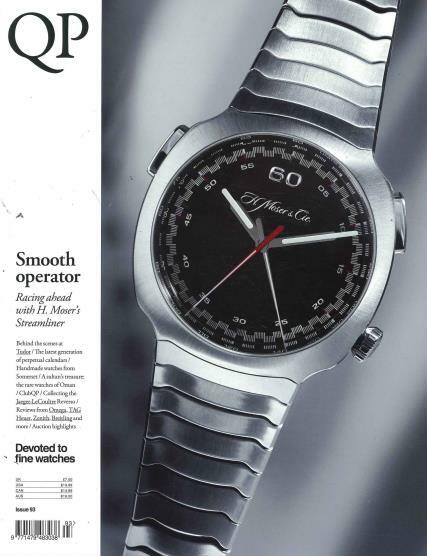 The magazine has chronicled the launch of the unbreakable mainspring, water resistance, shock resistance and lubrication free watches and new constant force escarpment technology. Follow the fascinating watch making industry with a subscription to QP Magazine.